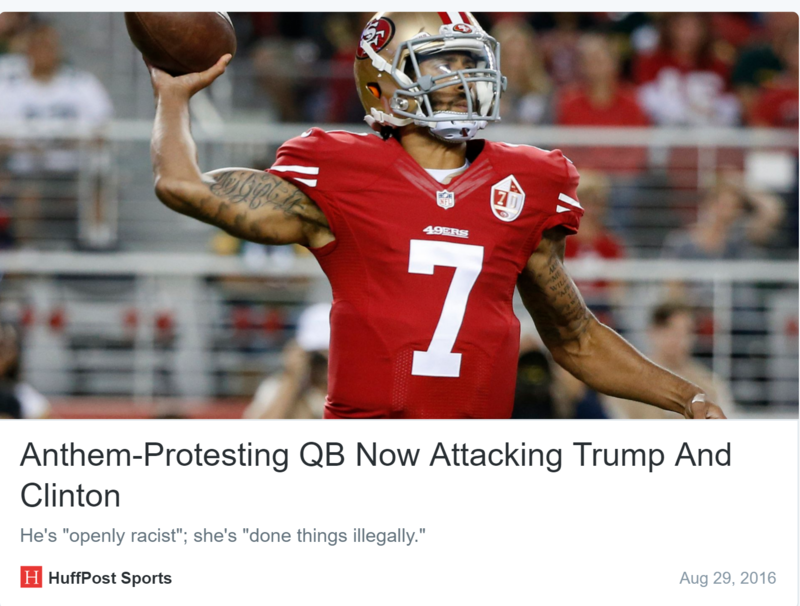 So Are We Just Not Going to Talk About Colin Kaepernick Believing Hillary Clinton Belongs in Prison? Niners quarterback Colin Kaepernick is receiving praise from the black community this week for remaining seated during the national anthem in a protest against racism and police brutality. What’s not being discussed, however, are his comments on Hillary Clinton. You have Hillary [Clinton], who has called black teens or black kids super predators. You have Donald Trump, who is openly racist. We have a presidential candidate (Clinton) who has deleted emails and done things illegally and is a presidential candidate. That doesn’t make sense to me. If that was any other person, you’d be in prison. So what is this country really standing for? Are black Clinton supporters going to just ignore this admission? I don’t support her or Trump and if we had done the same thing, we would be in jail. Sis I was just about to write that! Thst may be true, but you definitely dont want Trump as President. Don’t like that she may have done that, but in no form will Trump make office!!!!!!! Y’all forgot to add “Donald Trump for President” in the title. I don’t support Hillary. She’s just as bad as Trump. Still ain’t voting for Bernie. The candidates are……….but we can’t talk about it if you like. Yes, Black Clinton supporters are not only ignoring this, but so is the mainstream media who is going after Trumps “I told you so” moment with the Chicago murder of Dwayne Wade’s cousin. They are notably covering Anthony “show me your” Weiner though and his connection to the Clinton’s trusted advisor wife of his. This election is all about “How Low Low Low Low” you can go as that Flo Rida song went. It needs to be played as the anthem for the 2016 election. I say vote for neither and go for either the Green or Libertarian candidates. Need Roland Martin to invite breaking Brown to TV One. Breaking Brown belongs to a white supremacist group. He had facts on Hillary’s racism…he just said Trump was openly racist with no facts behind it why is that? No! Why should we care? Just because she is about to become President, doesn’t mean that she hasn’t thrown black people under the bus. In order to further her and her husband’s political careers. We don’t have to put our heads in the sand and, pretend that we dumb when it comes to Hillary Clinton. So I am voting for Hillary Clinton. But I stand with Colin Kaepernick! Ok what has Trump said that was racist? Those emails are a matter of national security. She was definitely doing more than being careless in the security of the data exchanged, and was likely giving away secrets. That put they U.S. citizen @ risk; she deserves to be in jail. Colin stood up for black issues after 2 years of all out war waged against black men in the NFL. The black male was the abusive boogie man who had to learn how to behave and white women were going to learn him. Now a black man has kicked these people in the teeth with a real issue that actually effects the game. I didn’t like his race attack on Trump, but his bashing of Hillary showed me he has more sense than most of us. Colin understands the law better than the race explainers who think Hillary violating procedures for classified documents is cute and cuddly. I wish he would have mentioned the drug dealing and body count, rising every day. Also remember Gabby Douglas. Sister stood up proud for the anthem and they crushed her for not having her hand over her heart.